Why is this man sitting on top of a dead horse? A vintage Sheboygan photo, taken before the turn of the 20th century, has sparked some conversation in the community since its inclusion in The Sheboygan Press’ 2007 calendar. The photo, which is inside the calendar’s front cover, shows a scene at Eighth Street and Indiana Avenue, looking north toward the Eighth Street bridge. 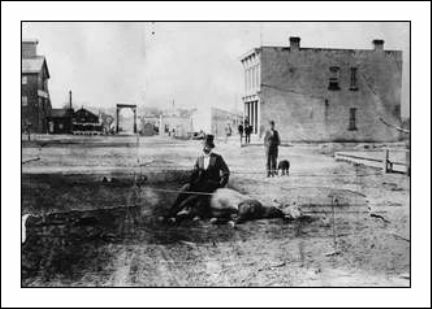 In the photo, a dead horse lies in the street, roped off with string tied to stakes in the dirt road. A man in a top hat, bow tie and jacket sits on top of the horse, and people in the background are standing still, looking toward the camera. If you have any idea of why this tophatted man is sitting on a dead horse in the middle of the street or know the history of this photo or have any other information concerning the scene, the Sheboygan Press would like to hear from you. 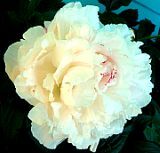 Contact Janet Ortegon at 920-453-5121 or jortegon@sheboygan-press.com. The original title of the picture was apparently “bilde”—German for “picture”. First we treat you nicely and then we eat you. Farmers in Cheshire are dressing their geese in woolly hats and scarves. They hope keeping the birds warm will help them to be happier, fatter and tastier for their Christmas customers. December 17, 2006 Posted by oldstersview | Uncategorized	| Comments Off on First we treat you nicely and then we eat you.